Get ready to Webb 24/7! Webb’s Giving Day, known as #webb247, is coming back on April 25-26 from noon to noon! Join us as we celebrate our 24/7 community that makes Webb so unique. Make your gift! 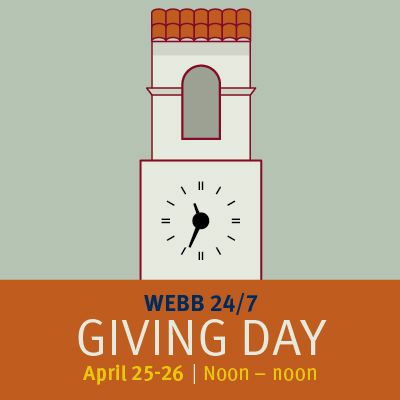 Visit webb.org/giving and make your gift before noon on April 26. Our goal is 405 gifts in honor of our students. Respond! Webb students, alumni and parent volunteers will be encouraging everyone to make a gift. Volunteers will contact you by calling/emailing/texting to ask for your support. Post on social media! Show us how you ‘Webb’ by tagging us on Facebook, Instagram and Twitter using #webb247 or #webbaroundtheworld. Interested in issuing a Match or Challenge? By creating a match or challenge on Giving Day you can motivate alumni, parents and friends to make gift. These matches or challenges have a major impact on Webb Giving Day. For more information click here. You can also learn how to be an Advocate through GiveCampus. Contact Angie Pfeiffer, director of The Webb Fund at (909) 482-5288 or apfeiffer@webb.org. You can also download our Webb Giving FAQ by clicking here.